At home with Ferran Adrià: Cocinar en Casa, no, seriously.. I've recently come across a book that got me hooked -not from the first page- but from the very front cover. 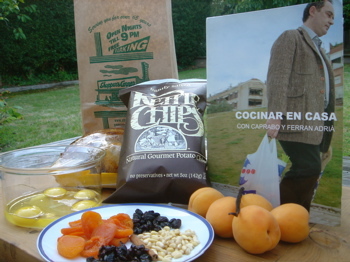 It was a picture of Ferran Adrià walking, looking ever so slightly morose, a grocery bag in each hand. The book is called Cocinar en Casa, Home Cooking, a collaboration between the famous grand wizard of elBulli and a Spanish grocery giant Caprabo. And since Ferran has famously proclaimed in many interviews that he used up all his cooking juices in elBulli's kitchen and did no cooking at home, the photo on the front page was even more ironic than it was intended. The basic idea is a semi home-made of sort, taking common foods from supermarkets and sprucing them up a little. Well, in this particular instance, quite a lot, since these ideas came from that amazing brain of Ferran Adrià. Whether you like the food or even agree with the approach at elBulli, it's hard to not acknowledge that Adrià is certainly a genius - a mad one, perhaps, but a genius none-the-less. Here the genius is again at work, doing his thang on humble ingredients from a common supermarket. And, no, you're not required to get a degree in Biochem or even a chemistry set to use this book, just a Sifon or two will do nicely. There are some wow why didn't I think of that moments in the book, like a recipe for caramel foam that prescribes melting a pint of Haagen Daaz icecream in the microwave then feeding the melted concoction into a Sifon, et voila, caramel foam! What about frozen gazpacho popsicles? Take canned gazpacho, pour into little cups, add popsicle sticks, freeze. How much easier could this get? Or another one, for Mojito para Todo el Dia, Mojito for all day - your ordinary everyday mojito, with a sheet or two of gelatin, into the Sifon and out come a foamy mojito. Keep the Sifon cool in the fridge and you can have mojitos all day. Tell me if that doesn't sound bloody superb to you. And how about one for Super Pizza, take a simple store-bought cheese pizza, then transform it with fresh mozzarella, basil, peeled cherry tomatoes and olive oil, precisely applied with an eye dropper no less. Pida una pizza y conviértala en una superpizza. You don't even need to speak spanish to understand that. A few recipes probably wouldn't work here in the US of A. The one for a simple asparagus in vinaigrette, for example. Take a jar of beautiful white asparagus, pour out half the liquid content, replace it with good olive oil and vinegar, close the lid and give it a good shake. There you have it, white asparagus in vinaigrette. The recipe looks like it would work wonders on beautiful preserved white asparagus from Spain. But would you really do that to canned vegetables you could get at Safeway? I shudder at the thought. Even more cause for concern are these recipes for various raw things. I don't think Ferran has ever seen the inside of a Safeway, let alone the fish or meat counters, or he wouldn't be telling us to do a salmon sashimi from supermarket fish! And then there are a few -a few- that are rather dubious looking on their very own merits. The most famous -or infamous I should say- is the recipe for the classic Tortilla Espagnole, the spanish national omelette. Here the mad scientist Ferran prescribes using bagged potato chips instead of potatoes -oh, pardon me, not just any chips, but bagged potato chips fritas en aceite de oliva. The classic tortilla espagnole recipe calls for cooking potato slices slowly in olive oil, so I guess Ferran is trying to stay in that spirit. Well, this looks so dubious I simply have to give it a try, that tortilla espagnole à la Ferran. And while I'm at it I might as well make a meal out of the book, no? So that was what I set out to do yesterday. I picked three recipes. The tortilla would be the starter, then the main course of chicken - store-bought roasted chicken all dressed up in a simple sauce made of dried fruits and bit of Sherry and Port - followed by a dessert of apricots with honey and saffron. The recipes offered up a bit of a challenge. The tortilla recipe simply called for a medium bag of potato chips. Well, um, dear Ferran, there was no such thing to be found at my local markets, nor could I find one that was fried in olive oil. Geez, it was hard enough to find a bag that wasn't flavored with BBQ sauce, or sour cream and onion, or honey dijon, or musquite, or whatever the heck it is people liked in their chips these says. What ever happened to simple salted potato chips? I finally settled on a bag of Kettle Chips, just as good a bag store-bought chips as any, I thought to myself. Then, there was the question of the chicken. Finding a whole roasted chicken in Santa Cruz proved to be a bit difficult, but I finally found one, sitting properly in a styrofoam tray, at Staff of Life. (Oh just hush about the name already, didn't I say I was in Santa Cruz?) Oh, right and there were no dried cherries to be found - I needed them for the chicken - so I bought some dried cranberries instead, that would give it a bit of a North American twist I supposed. Armed with my provisions, I set out to follow the recipes, just as precisely as I could. That proved to be a bit of a problem too. How many chips were in a medium bag I wondered, then decided that I couldn't be bothered and just used half the content of the large Kettle Chips bag. Four eggs were whipped in a large bowl, then the content of half the bag of Kettle Chips went in, all broken and crushed of course. The recipe said to wait 5 minutes for the potatoes to soften up properly. So I waited the requisite time. The potatoes still didn't look very soft to me, but Ferran said five minutes and who was I to argue with him. So, the pan came out, - the smallest one I got, in fact it was so small it wasn't a pan at all, but a lid for another Le Creuset sauce pan - then in went lots of olive oil and the eggy-chips concoction. That was about it for the tortilla, now my attention could turn to the chicken. The recipe for the chicken called for first cutting up the chicken and reserving the juices for the sauce. Um, what juice? My chicken was nearly as dry as the styrofoam tray it came in. It was also rather large. I'd bet it was at least a third bigger than its cousin that Ferran was cutting up in the photo. Oh well, what was a girl to do? So the chicken dish got made, with dried apricots and cranberries and raisins and even some pine nuts. Oh, right, and a piece or two of lemon rind thrown in for good measure. I couldn't find any Sherry in the house so I used Sweet Vermouth instead, close enough, really. Then the simple dessert. I intentionally skipped the super delicious farmers market apricots and got some rather pedestrian looking ones from the store, to keep in the spirit of the book. The apricots got halved, smeared with vanilla seeds scraped from a pod, and then drizzled liberally with honey. A few strains of saffrons went on top and the entire thing got wrapped neatly in a foil package, and in it went in the oven for 10 minutes. How did everything turn out, you asked? Well, let's just say I'd stick with the classic tortilla espagnole. If it ain't broke, if it ain't broke, my friends. The chicken was quite delicious, though the lack of juice from my chicken meant that I had precious few drops of sauce to go around, particularly on the huge American bird. Next time I'll just add more liquor, that should do it. And then the dessert, the apricots -and the gloriously golden, honey and saffron infused, sauce- were served with vanilla icecream, store-bought of course. It was quite a nice way of fancying up dowdy and tasteless supermarket apricots. You really should try this at home. I've got a few more recipes in this book that I want to try. Well, as soon as I get myself an iSi Sifon I'll play with some foam stuff for sure. I'll keep you posted on my progress. In the meantime, you can order this book directly from the restaurant. If you can't make it to elBulli, then perhaps this book will bring a little bit of elBulli to you.